Of all the ways to stay fit, walking is the easiest, safest, and cheapest. It can also be the most fun: a fine day, a good companion, an attainable goal (say, a scenic spot) three or four miles away. On city streets, in the woods, or even round and round the high school track, walking is the best way to experience a landscape. If it's too rainy for anything but a treadmill indoors, at least you can read or watch TV. And after your workout, you know you've done yourself some good. Walking briskly for one mile (brisk usually means 3.5 to 4 miles per hour) burns nearly as many calories as running a mile at a moderate pace, and confers similar fitness and health benefits. Even strolling or slow walking (about 2 miles per hour) confers some benefits. A Harvard study of almost 40,000 female health professionals found that walking as little as an hour a week, at any pace, reduces the risk of coronary artery disease. Longer and more vigorous walking produced a greater risk reduction. 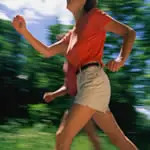 Try to walk briskly for at least half an hour every day, or one hour four times a week. If you weigh 150 pounds, walking at 3.5 miles an hour on flat terrain burns about 300 calories per hour. So this schedule would burn about 1,100 calories a week (studies show that burning 1,000 to 2,000 calories a week in exercise helps protect against heart disease). If you can't work that into your schedule, try more frequent, shorter walks. Make an effort to walk as much as possible. Skip elevators and escalators and take the stairs. Leave the car at home if you can walk the mile or two to a friend's house. Walk to work, at least part of the way. Get a pedometer and see how many steps you take a day. Aim for 3,000, and then try to work up to at least 5,000 steps (about 2.5 miles for the average stride) in the course of your daily activities. Some Japanese health officials advise 10,000 steps as a goal, though there is no magic number. To achieve the higher goals, you'll have to include some brisk exercise walking in addition to walking at home and at work. If you want to go faster, instead of taking longer steps, take faster steps. Lengthening your stride can increase strain on your feet and legs. Swing your arms. One good option: bend them at 90 degrees and pump from the shoulder, like race walkers do. Swing them naturally, as if you're reaching for your wallet in your back pocket. On the swing forward, your wrist should be near the center of your chest. Move your arms in opposition to your legs--swing your right arm forward as you step forward with your left leg. Keep your wrists straight, your hands unclenched, and elbows close to your sides. The vigorous arm pumping allows for a quicker pace, and provides a good workout for your upper body. And you'll burn 5 to 10 percent more calories.